The day began with a violent attack of mortar rounds. The German machine-gunners began firing at the French again from the Gandoet Ravine. Gandoet ordered Jordy to take the rocky spur on the pass between hill 721 and hill 681. Goiffon attempted to object, given the exhaustion of the 11th Company. Gandoet refused. Goiffon was killed around 8.00 a.m. in a German attack on hill 721. He was replaced by Captain Jean, who was also killed a little later, around 11.15 a.m. The French artillery redoubled its efforts to support the occupied positions. Lieutenant-Colonel Guillebaud took command of the 4th R.T.T. replacing Colonel Roux. The situation of the 1st Battalion was becoming more and more critical. Non-stop shell bursts surrounding the house. One of them hits a dormer window that had been stopped up with stones. The room suddenly full of dust, stones and shards fly everywhere. A horrible sight, in the corner occupied by the battalion’s post 284: one of the two radio operators, the one who turned the dynamo winding handle, had lost the top of his skull and the brains were visible. He was still sitting in the same place. Towards 5.00 p.m., Bacqué decided to launch a counter-attack, using bayonets in order to free up his H.Q. The operation was a success. The riflemen ran down the sides of hill 382 and took 70 prisoners, who were from the German 85th Mountain Regiment. A convoy of sixteen mules had left San Elia: only two arrived at the battleground. Juin and Monsabert were going to give the order to counter-attack at the close of the 27th and 28th. The 1st Battalion was to take hill 771, then hills 915 and 875 which had been taken initially. The 7th R.T.A. would assault hill 700 (10th Company (Gauthier) and the Péponnet battalion). Lieutenant Spiroux would accompany Lieutenant Gauthier with the few survivors of the 9th Company (Denée). 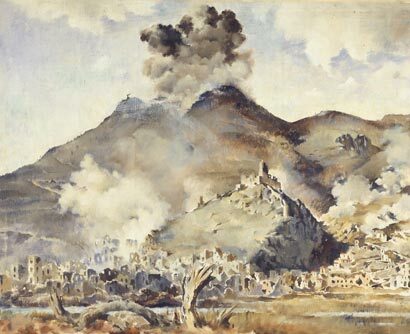 The 3rd Battalion was to retake its O2, hill 862, with a detachment from the 3rd R.T.A. in support. The Germans continued shelling during the night of the 28th to the 29th. The French artillery made it possible for the positions occupied by the 4th R.T.T. to be consolidated. Lieutenants de Villèle and Stéphani sent a stream of coordinates, all with mathematical precision. The artillery was also raging in the valley (3rd group of the 6th R.A.A. (African Artillery Regiment) and the 2nd group of the 64th R.A.A.). The shelling statistics say a great deal. The gunners and ammunition servers were sometimes so exhausted by the speed of the effort they had to make, they literally collapsed from exhaustion. On several occasions, the officers replaced them. In shirt sleeves, pouring with sweat in mid-winter, Captains Briatte, Bard, Guérin, Luthereau, Rouleau, de la Roussière, and Tainturier carried, loaded and fired the shells themselves. Collapsed around them, their men slept. Chergé’s group was the same. The officers manned the guns, forcing the gunners, who were reeling from exhaustion, to let them take over, so the men could pause for breath. We pictured them lying on the earth, holding their helmets in their arms, to protect themselves from shrapnel, or fingers on triggers, eyes on the watch, ready to fire at the slightest sign, with, only a few feet away, a wall of fire protecting them from the massive assault that was ready to overwhelm them. We knew that we got them out of trouble, the poor blokes on hills 862 or 721, ten or twenty times. Without the artillery, they would have been finished! They knew this and told us through their liaison officers, sending thanks with wild enthusiasm. Well done the artillery! So how could we have stopped, or thought of resting? Everyone who had a role to play wanted to be there, to take part, to give their all. The artillery took over from the infantry in the night of the 28th to the 29th in order to allow the French counter-attack to be prepared.